Watching my poor gander moping around the yard, waiting for his partner Pie to hatch their babies gave me the idea for this post. Xander and Pie are first-time parents, but this being my fifth year hatching geese, I have seen how ganders get through the incubation period. First, you need to latch onto the closest large, white bird in the farmyard. 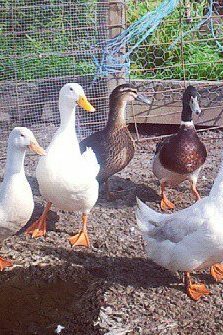 My original gander, Clyde, would spend the incubation period following a couple of large white hens around, pretending he was one of them. He would graze in the paddock with them and rest in the driveway with them. They, in turn, would look at him funny sometimes, but mostly ignore him. Xander has taken up swimming with Derek the Pekin drake and his two lady friends. But a lot of the time, the lonely gander will park himself near the nest and watch. At dinner time, Xander calls out to Pie to let her know that it is time to come out and eat. Pie will cover up her eggs and venture out into the pen. Sometimes they go for a quick swim together or graze for a little while. When the goslings hatch, Xander will become their fierce defender. He will hiss and chase a lot. At people. At the goats. At the car. At anything that comes too close to his little family. And he will keep this up until yellow fluff and stubby wings give way to the great long flight feathers that geese are known for. 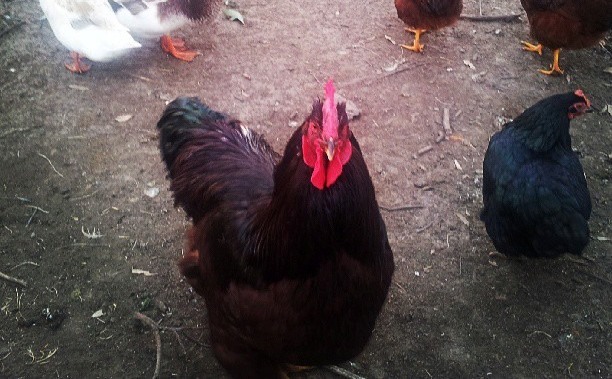 This rather stern looking fellow is Russell Crow, the Rhode Island Red rooster. And he is a lot more laid-back than his appearance suggests. He is actually a complete gentleman, except for when he jumps up to try to take the feed scoop from my hand while I’m shutting the gate. He is a leader, but a fair one, keeping his family together as they wander around the farm. For a big rooster he is not especially noisy or argumentative. He crows about an hour before sunrise, but he is not one of those insecure sorts who will crow all day and night. Malcolm came with the name ‘Dennis’ which I wasn’t inclined to keep. I don’t remember what the meaningful name I first chose for him was, the first name that always came out of my mouth was Malcolm, so it stuck. It kind of suits him. He is another fairly chilled-out rooster. He was hand raised by his previous owner, so will run up to you in case you have food. He doesn’t argue with Russell, the two of them really keep to their own kind and leave each other alone. He is a fairly worthy replacement for my old black Silkie boy Brewster. 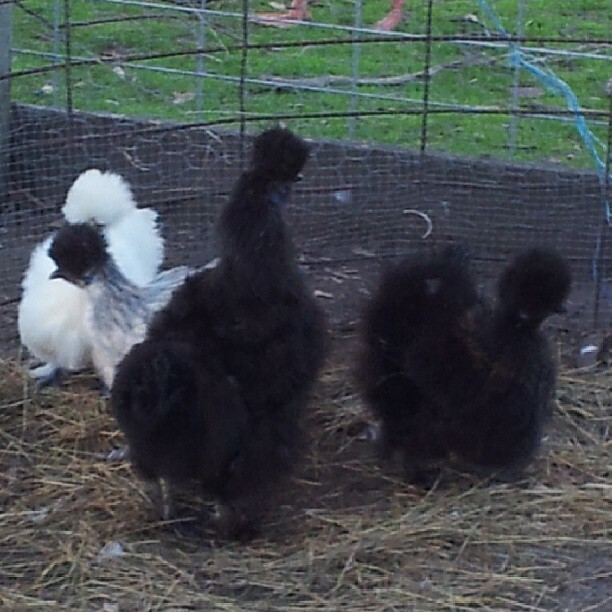 I hope that once my Silkie girls lay, young Malcolm can pass on his easy going nature to some cute, fluffy babies. Second from the left in this photo is Derek. Derek is a Pekin drake, and got his name because he is a bit McDreamy. He came from the RSPCA at Burwood, where my friend Kerrie volunteers once a fortnight. 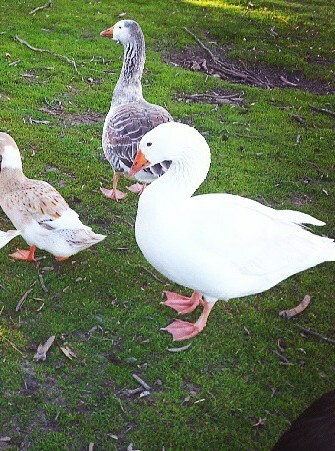 My two ducks took to him straight away, and escorted him to the dam the day after he arrived. Watching this lovely bird, who had spent many weeks in a concrete pen, take to the water for the first time was absolutely heart-warming. Derek is a real sweetheart who has fitted neatly into the mixed flock. The green-headed, claret-breasted fellow on the right in this photo is Ringo. Named for his ‘Beatle-green’ head and the ring of white around his neck. Ringo is a Silver Appleyard who fancies himself as a bit of a ladies’ man. His wife Mildred is never far away from him, and their daughters tag along. He also has eyes for Derek’s girls, especially Roberta. I am hoping for a few hatches of ducklings this year, which will be a team effort. Obviously the ducks have to lay the eggs, and the drakes have to put the ducklings in them (to put it delicately). But Pekins and Appleyards are known for being poor sitters, so the plan is for the Silkies or the red hens to hatch and raise the ducklings. If that eventuates I am sure that will be a post in itself.